Most of the Texas panhandle is dead flat. West of Amarillo and Lubbock lies a vast caprock plateau, around 4,000 feet in elevation, that extends far into New Mexico and is crossed by a regular grid of straight roads, one every mile, aligned exactly north-south and east-west. About every sixth is a main, paved route while the most of the others are unpaved dirt tracks. Towards the south are many oil wells and refineries but most of this area is used for agriculture - crops and cattle - and is not especially interesting to drive across. 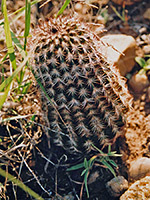 So it is for the land around Amarillo, but not far to the southeast, the flat plateau breaks up quite suddenly into a series of steep, eroded cliffs and canyons, part of a 300 mile long escarpment that separates the level land of the west, known as the High Plains, from the lower, more uneven Rolling Plains of the east. The biggest canyon of this great divide is that of the Prairie Dog Town Fork of the Red River; Palo Duro Canyon, which is known as the Grand Canyon of Texas and is supposedly the second largest in the USA. This is based on its length (120 miles) rather than depth, as although very colorful, rugged and scenic, the ravine is never more than 800 feet deep, so quite shallow by Southwest canyon standards. 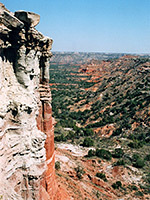 Seven miles of the upper (west) part of the gorge are contained within Palo Duro Canyon State Park, established in 1934 and now the fourth largest state park in Texas. Only one road leads to the park - country route 217 which approaches from the west, starting at the appropriately named town of Canyon, 16 miles south of Amarillo. 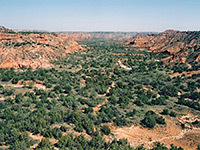 The Red River begins just north of Canyon, where two lesser streams converge (Tierra Blanca Creek and Palo Duro Creek), and starts to form its canyon just a few miles west; the very upper part can be seen by driving along road 1541, another north-south route from Amarillo, but then further west, the meandering canyons and badlands make it difficult for any roads to cross, and for the 150 miles from here to the Oklahoma border there are only 5 other routes across the Red River. The park entrance road 217 at first passes scattered ranches and houses, then just empty prairie as the edge of the plateau approaches. Once past the entrance station (2016 fees $5 per person for day use, $12 and upwards for camping), and a visitor center/museum, the road affords a first glimpse of the canyonlands from several overlooks, then descends quite sharply to the valley floor. The view from the rim is of the main canyon, extending southeast into the distance, and of several tributary ravines, all steep sided and ledgy, formed of multicolored, banded rocks yet covered by quite a lot of bushes, trees and grass so that the two dominant colors are green of the vegetation and red of the rocks. After the descent from the rim, the park road extends only 6 miles further, ending in a 2 mile loop. All the area is well developed, and every half mile or less passes a carpark, campsite, trailhead, etc. The road is mostly bordered by dense bushes, and crosses a streambed 6 times - usually dry, but subject to occasional flash floods that may cause the park to be closed for a time. 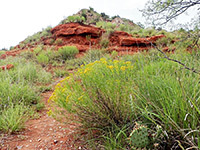 Palo Duro Canyon is a popular, busy place, apt to be full at some summer weekends, and it isn't always easy to find solitude, even on the trails. But hiking is the main activity, along with horse riding, camping and cycling, and for off trail exploration the park does have a sizeable backcountry area to the southwest. Givens, Spicer & Lowry Running Trail; at 11 miles, the longest route in the state park, this winds across badlands and canyons with a few short, steep climbs. Lighthouse Trail; 6 mile path to the most famous formation in the park. See full trail description. Paseo Del Rio; an easy, level 2 mile round trip alongside the Red River. Sunflower Trail; another 2 mile route through bushy land close to the river. Triassic Trail; the only route that begins at rim level (at the visitor center), this traverses the cliffs a little way below the edge of the plateau then follows a narrow ridge that ends in a rocky summit (Table Rock) with great views south over the canyon. There is evidence of settlement in Palo Duro Canyon for around 12,000 years, and in more recent times the area was inhabited for various periods by the Apache, Cheyenne, Comanche and Kiowa tribes up until 1874 when they were forced to move west into Oklahoma, as a result of the Red River War that displaced Native Americans from all across the southern plains. Soon after the clearance, the 100,000 cattle JA Ranch was established and the canyon remained privately owned until opening of the state park in 1934. The nearest places with hotels close to Palo Duro Canyon State Park are Amarillo (34 miles) and Canyon (20 miles).